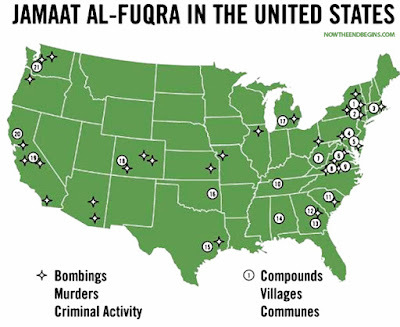 Part of Trumps draining the swamp has got to be the shutting down of the nearly 30 Muslim Jihadist Terrorist training camps that are spread all across the United States. For more than 40 years the Shadow Government working behind the scenes of politics has been encouraging and protecting the Islamic agenda of infiltration and the eventual overthrow of the United States government by any means necessary, turning America into just another Islamic State just as has been happing in history all over the world from the 7th century to date. The 70 acre compound of Islamberg has actually been located in the Catskill Mountains in Upstate NY for more than 62 years. 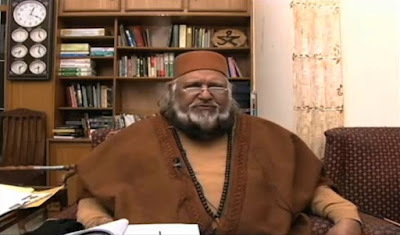 Once used by a Catholic Priest as a sort of boy’s town correctional facility for wayward boys, it passed through multiple hands and eventually into the hands of an Islamic terrorist known as Sheikh Syed Mubarik Ali Shah Gilani, a Muslim Jihadist with known ties to the terrorist organization known as Jamaat al-Fuqra. Mysteriously hidden and nestled deep within the woods of the Catskill Mountains in New York State it has been for more than 20 years a Muslim Jihadi compound called Islamberg. The only way to access the 70-acre compound is through primitive dirt roads, a Muslim NO GO ZONE where hundreds of Muslims have for years lived in seclusion away from the prying eyes of curious Americans and protected by Deep State federal security agencies. There are more than 20 known such terrorist training camps (shown on the map below) in the U.S. all protected by corrupt federal Deep State security agencies. 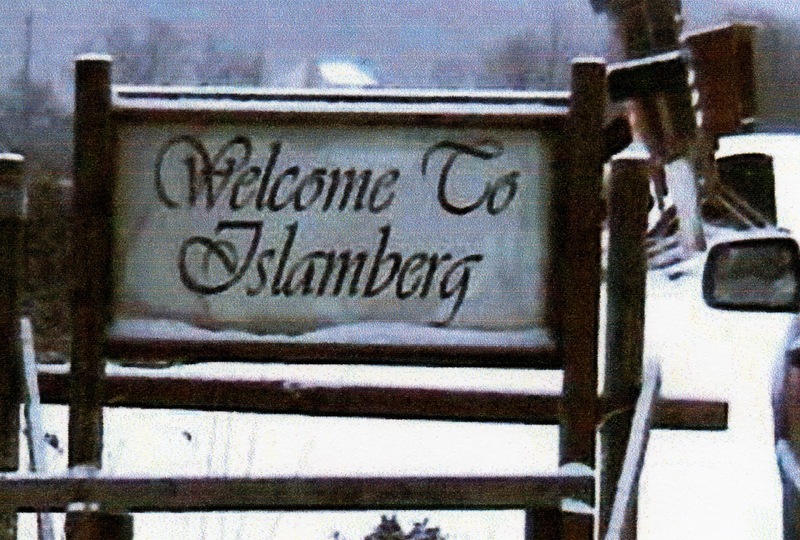 For over two decades, infidels have been prohibited from entering the Islamberg compound, as anyone attempting to enter would be “greeted” by an armed Muslim patrol in a guard shack at the compound’s entry gate. Without local legal access to the compound, there’s been no way to confirm what was known about the location being used as a training ground for Muslim terrorists. But after an alarming incident involving one of the Islamberg residents, local police finally got involved. And what they discovered that these Muslims have been quietly plotting for years is nothing short of chilling. Note: Yours truly brought this to the attention of the FBI more than 10 years ago, the response was a threat of shutting down my blog if I didn’t cease and desist. Well de Andréa doesn’t cease and desist printing the truth. For over two decades, this cult group of Terrorist Sharia - following Muslim Jihadists have lived secretly under the guidance of Pakistani Sheikh Syed Mubarik Ali Shah Gilani, a terrorist Muslim imam with known ties to Jamaat al-Fuqra, a terror organization responsible for a long list of terrorist activities around the world, including murders of rival religious figures right here in the United States. Locals in the area have often times reported the sounds of gunfire and explosions emanating from the compound, but because the Muslims weren’t necessarily breaking any laws, there was nothing that law enforcement could do except keep a close eye on the place from a distance. 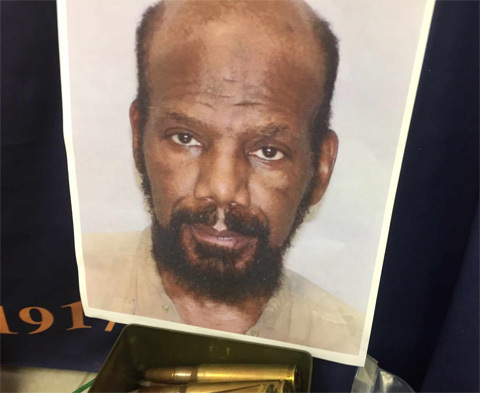 Shortly after arresting Ramadan Abdullah for theft, the Muslim’s answers about why he was stealing ammunition raised suspicion among police, and provided probable cause to obtain a search warrant to investigate their suspicions further. 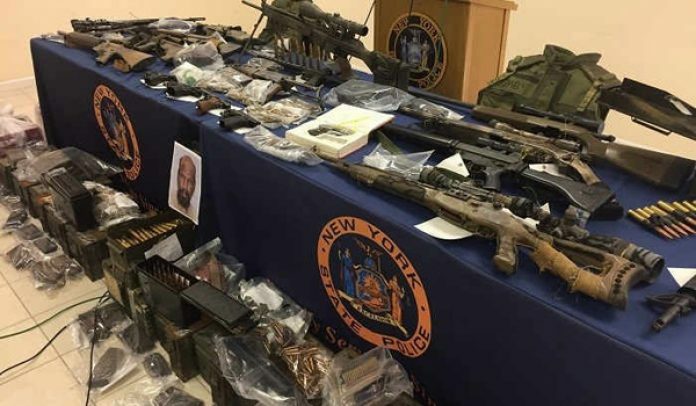 During their raid they discovered a massive stockpile of illegal weapons that were to be transported to the compound, including 8 assault weapons, 4 loaded handguns, 1 loaded shotgun, 2 rifles, 64 high-capacity ammunition feeding devices, and body armor, including thousands of rounds of .50 caliber ammunition capable of piercing body armor. But illegal cache of weapons seized from Abdullah was unfortunately just the beginning. A long-time associate of a U.S.-based Islamist terrorist organization, Muslims of America (MOA), has been arrested in New York following the discovery of a large cache of weapons that were intended for MOA’s “Islamberg” headquarters in Hancock, NY. THE BOTTOM LINE: Doesn’t it beg the question, what was he doing with all this and what were his intentions down the road? Well I have been questioning the FBI on the existence of all the terrorists training camps in the U.S. for years…they simply ignored and threatened me... now I know why. On several occasions, As far back as 2007 I have reported on the alarming things going on in Islamberg, exposing how 22 known training camps within the United States or as many as 30 are directly associated with the MOA terror network and Ramadan Abdullah. Below are a few chilling videos related to Islamberg. Watch for yourself, watch as many of the successive videos as you need - to convince yourself that the government security agencies have been tangled up in and supported the Islamic terrorist organizations for years. All for the ultimate purpose of overthrowing our existing culture and type of government and replacing it with a single one world tyranny.